Google is in trouble, and they need your help! It seems like Google are now asking their users to help them out with their search results pages and site rankings. That’s a major change to Google’s normal attitude that we’ve been accustomed to in the last few years. Google’s cry for help, as captured by Nathan Sauser. This feedback form might seem like a minor anecdote, but I believe it’s the first sign of game-changing news. Are Google taking a 180º u-turn from Panda & Penguin updates? I’ve seen first handed how easy it was to make money online with low quality articles back at 2010. By spreading and posting tons of spun versions of the same articles across multiple content farms like EzineArticles, eHow and Squidoo, marketers captured easy traffic. It was too easy to make money with bad content and without providing anything valuable to the readers. Those years, internet marketers were taking full advantage of such tactics, and spammy websites were KILLING Google. Something had to be done. And so, Panda and Penguin algorithms were born. Panda and Penguin are both Google’s time-tested way to fight spam: with clever algorithms. But now, it seems like Google are suddenly asking for the users’ opinions. How come? Why would Google change its attitude? Although Google certainly does a good job at spotting and penalizing spammy websites, they aren’t perfect. Internet marketers and SEO experts are always trying to find the next hack, the next trick, that will let them cheat the rankings. Every time someone comes up a new technique to cheat the rankings, Google makes an algorithm update and the door closes shut – till the next time. Are Google realizing it’s an endless-circle? Maybe there’s a better way to approach this? 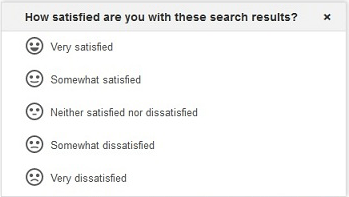 Are Google taking these surveys seriously? What exactly are they doing with the feedback they’re getting? What can we learn from this laconic answer? Although it’s only an experiment right now, Google are seriously thinking of making these user feedbacks one of their ranking criteria – that’s massive! Are Google reinventing a ranking system from 1994? You know the feeling when you go into a website and you just KNOW it’s spammy? You just feel the ads looking at you from every corner, affiliate links fill every spare inch of the screen, and you just know subconsciously that it’s time to hit the “back” button, and hit it hard? The human brain can spot a spammy website from miles away. We can smell it, and it stinks to heaven. That’s why web portals (remember those?) started off with manual ratings back in 1994. As the internet outgrow this old-fashioned method, web portals vanished and got replaced by a monster with amazing computer analysis skills – Google. Why does Google need YOUR help? Google can’t ask their staff members to manually rate all the websites on the internet. It’s obviously unreasonable, impossible and pointless. But if they get some feedback from their users – even for only 0.1% of the searches, it sums up to 3 million reviews per day (based on world’s statistics). That makes the ranking efforts somewhat more manageable. And as no one cares what happens after page 2 on Google, you only need to eliminate the spam out of the top 20 sites for a given keyword. Google are already monitoring retweets, likes, +1ones and other social signals. It only makes sense that they’ll collect this user feedback too, and combine it with the already existing social signals. But this time, you’ll be able to down-vote bad quality sites. Hooray! What does it mean, and how will it affect you? It’s all fine and dandy. Maybe even cool. But let’s cut to the chase – how can this affect website owners and internet marketers? I believe this is Google’s battle cry against spammers. Websites that have great multimedia content and are publishing it at a good solid pace – will rank well. Websites getting retweets, likes and +1ones in addition to their great content – will continue to rank even better. HEY! That’s no news is it? Of course websites with good content that lots of people talk about will rank well! DUH! If the prescription for Google Love doesn’t change – who cares? The people that still build websites for search engines, and not for humans. Should care. The people that build websites only to make fast income from moving web traffic from one site to another. Should care. I strongly believe this is the case. Utilizing crowd-sourcing to recognize and deal with spam makes total sense. What do you think about it? Just a silly survey, or the beginning of a new era? Leave your thoughts in the comments section below! Nice thought but I’d need evidence that Google have stopped favoring their own commercial interests above customers’ needs and I don’t see any of that. This is just more window dressing. The quality of search results is lower mostly because Google is favoring their advertisers rather than focusing on giving users the answers to their questions. I’m happy you joined the conversation. Can you give an example of what you mean when you say that because of Google favoring the advertisers, the search results’ quality is low? If the quality of search results won’t improve, and people will continue doubting Google’s results, at some stage Google’s revenue will suffer too. Although Google doesn’t make money from search results per se, search results are still the core of their business. At least that’s my opinion! As such, I believe it’s in their top interest to have superior search results, which frankly is not the cast right now. You might say that i’m being naive in seeing it this way. After all, they have so many other things going on, but still, for most people, google is first and foremost a search engine, then all the rest. Let me know what are you suggesting they should do? Meron, I don’t know what part of Google’s operation is first and foremost but getting the most benefit out of other people content at minimum cost is a large part of it, whether search engine, books or whatever. I think SEO has less influence on results which Google feed to us than their commercial interests. That trend is increasing according to seobook.com/paid-inclusion. It’s filtering information, not to improve the results we get but to influence them and making use of material we don’t even want it to have. Definitely an important post that you shared. Thanks! I hadn’t stumbled upon their new vertical advertisements yet, but I hardly search Google for products. I agree with you that when search results look this way (like on SEO book post), it really, *really* doesn’t matter who’s ranking organically as no one sees the organic results anyway. BTW, did you get to try the (completely unrelated) new Twitter search?